Going Digital – making the transformation work for growth and well-being | The Forum Network, hosted by the OECD: Shape ideas. Shape policy. Shape the Future. Pro-active policies need to be developed to better address the challenges of the digital revolution. At a conference in China last year, the chief scientist of an American robotics firm predicted the world was approaching the “moment of singularity.” For the uninitiated, technological singularity is the hypothetical event in which artificial general intelligence allows robots and computers to replace human control and understanding. Yes, it sounds like the plot of the Terminator movies or a William Gibson novel. And no one can lay out a credible time line. But not too long ago scepticism would have been just as high if you had suggested that, say, a computer could beat a human chess champion or that cars would drive themselves. The digital economy is growing exponentially. It transcends borders, transforms economies and upends the policy landscape. We have gone from a society where technology made work more efficient to one where it is revolutionising every aspect of our lives, from where we work and play to how long we live. Our response to these fast-moving changes will define whether the digital revolution contributes to global economic growth and improves human well-being – or not. The digital revolution will backfire if it widens the gap between haves and have-nots and erodes the already-frayed trust between governments, companies and citizens. Failing to make sure that innovations in manufacturing, medicine and agriculture reach poor countries will threaten economic growth. Failing to prepare workers who lose their jobs to automation in wealthy countries will foster social instability. The clock is ticking. Some estimates suggest that nearly half of existing jobs will be eliminated by automation in the next 20 years. Even in wealthy countries, some poor and uneducated people are still shut out of the new economy by a lack of Internet access. The benefits of the digital economy are not distributed equally, leaving behind economic sectors and entire countries. So far, governments have struggled to respond to the complexity of this digital reality. They have been slow to develop and implement policies that take advantage of the truly global opportunity for increased growth, inclusion and well-being. And too many businesses treat people like a cost to be eliminated. No wonder so many people fear being left behind. There is time to get this right. There is time to develop pro-active policies that come to grips with the promise and the peril of the digital economy. And there is time to come to grips with the need for ethical guidelines and regulatory limits on artificial intelligence. The leaders of the G20, who represent the world’s wealthiest countries, recognise that the digital economy offers challenges as well as opportunities. As part of its G20 presidency this year, the German government has made a priority of developing ways to share the benefits. At the Organisation for Economic Cooperation and Development, we are confronting the digital revolution head on. We have started an ambitious, two-year project to examine how the digital transformation affects policy making across the broadest possible range of fields and topics. The project is called “Going Digital.” The objective is to work with governments, business, labour and civil society to develop policies to harness the power of the digital revolution for OECD members and developing countries and unlock the benefits for everyone. Fortunately, we are not starting from zero. The OECD and its member countries have done a lot of work analysing the impact of the digital economy and trying to shape policies that maximise its potential. The OECD’s Committee on Digital Economy Policy has tracked digital economic growth since 1982 and developed “soft law” on issues like privacy, security and trans-border data flows. The Committee will co-ordinate the new project. But the global nature of the challenge dictates a global response. So the new effort will expand the consultation beyond the OECD’s 35 members to experts, social partners and officials from emerging economies and the developing world. We aim to listen carefully and consult thoroughly. Just as the digital revolution affects every aspect of our lives, the project is founded on a whole-of-house perspective. 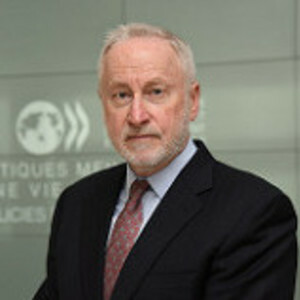 The unique strength of the OECD is our ability to bring together our diverse Directorates to draw on experts on tax, competition, industry, innovation and entrepreneurship, insurance and private pensions, financial markets, fiscal affairs, science and technology, statistics, economics, education, employment, labour and social affairs, public governance and trade. How will this unfold over the next two years? We will actively seek the support of the widest range of experts, countries and organisations through workshops and conferences. We will go on the road to brainstorm, consult and engage. We will use the OECD’s world-class capacity to gather evidence and provide critical analysis to underpin new policies. In the end, the goal is simple: the OECD wants to work with others to make the digital transformation work for growth and well-being. If that moment of singularity arrives, we want to help make sure the world is ready to use it to promote fair economic growth and social equality.